The Fresno Council of Governments (Fresno COG) is a consensus builder, developing acceptable programs and solutions to issues that do not respect political boundaries. Fresno COG is a voluntary association of local governments, one of California’s 38 regional planning agencies, and one of 500+ nationwide. In 1967 elected officials of Fresno County and its incorporated cities informally created the agency, formalizing Fresno COG in 1969 through a Joint Powers Agreement. Fresno COG undertakes comprehensive regional planning with an emphasis on transportation, provides citizens an opportunity to be involved in the planning process, and supplies technical services to its members. 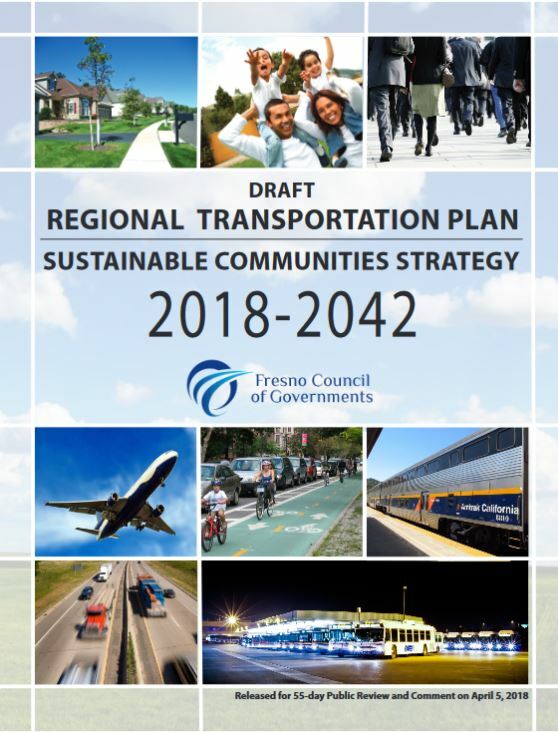 Fresno COG’s 2018 Regional Transportation Plan charts the 25-year course of transportation to 2042. As we address greenhouse gas emissions reductions and other air emissions it is our goal to plan sustainably, with purpose and direction. Look forward with us to Fresno’s future through the year 2042. The Regional Transportation Plan provides mobility to keep us moving. It is made up of a variety of different elements or chapters, and each element is augmented by additional documentation. The big difference from the last one is they’re now required to take into account greenhouse gas emissions. Anyway, the plan is up on the website here, and you have 55 days to comment. A public hearing will be on April 26, or you can send them a letter by May 15th. I took a quick look at it, but I have yet to be convinced that these plans actually result in any action, so I am not interested in diving in for more than 5 minutes. However, if you are, and you find anything of note, please feel free to share! (Could they really not find Fresno-specific pictures for the cover? I count 4 mediocre stock images, and one photo from NYC). This site is so informational, who are you guys? I’m a central valley native that moved to socal. Recently been thinking about moving back, but in the Fresno area to work on urban planning, etc. Perhaps add an about us (me) tab. Hi Victoria, it’s just me, and unfortunately, I have been incredibly busy. I did have an about me tab, but I didnt migrate it to my new layout.